If you look at any bibliography of childhood grief books, it is likely to be quiet extensive! Take for instance the bibliography on the Child Grief Education Association website, here. The good news is that there is no shortage of literature available. My question is, though, with so many choices- which ones are the best? This answer probably has much to do with the child's age, the questions they are asking and simply the child's personal preferences in books. A simple title of a book won't give any insight into the intricacies of the book, thus we must rely on word of mouth or websites such as BarrHarris.org, Childlife.org or the many other hundreds of grief websites that give a synopsis of the books. But even this doesn't give a clear understanding of what the book is like. The best option, would be to read them all ourselves. While a lofty goal that I have not yet achieved, this week I did the best I could; I went to my local library in rural America and checked out all the books I could find on childhood grief. Hopefully the reviews of these books, with illustrations and story plot will give you a more thorough idea of some of the children's books out there. For this first post I have chosen a book that has great appeal for adults as well as children. I would consider it a "cross-over" book, and may in fact be more of an adult book disguised as a children's book. Tear Soup is written by Pat Schwiebert and Chuck Deklyen, Illustrated by Taylor Bills. Published as a 3rd Rev. edition by Grief Watch in 2005, the age level listed for reading is age 4-8. The main character is Grandy, who has suffered a 'great loss'. 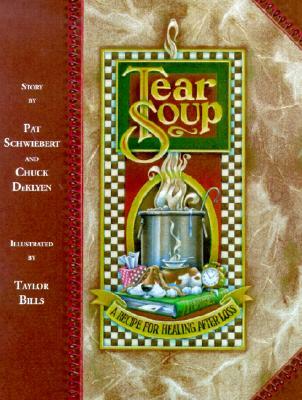 She spends the pages working on her tear soup, which serves as a marvelous symbol of grief. The universal statements packed into the book are so subtle, sometimes it takes a moment to recognize them. For example, "It seems that grief is never clean... To make matters worse, grief always takes longer to cook than anyone wants it to"
She deals with adding memories to the pot and even the profound concept of the time that memories seem to run out, and the emptiness felt then. There are interactions with neighbors and friends, as Grandy says, "They filled the air with words, but none of their words took the smell of tear soup away." Or when she comments that, "most people can tolerate only a cup of someone else's tear soup." The book also approaches faith issues, as Grandy "demanded to know where God was when she was feeling so all alone." As one might guess, Grandy works through her grief until she realizes it's time to eat something else instead of only tear soup. The book ends with a nice summary of Grandy's journey, "I've learned that grief, like a pot of soup, changes the longer it simmers and the more things you put into it. I've learned that sometimes people say unkind things, but they really don't mean to hurt you...and most importantly, I've learned that there is something down deep within all of us ready to help us survive the things we think we can't survive." This book has wonderful illustrations and while I am not sure a pre-school child would understand the significance of all the metaphors, it would certainly provide a starting point for topic discussions. It may also serve as a great recommendation for a family with an adult who has been resistant to dealing with their own grief... by innocently entering into the realm of a kid's book, they may be surprised to have issues raised within themselves. Stay tuned over the next weeks for more reviews of children's literature and feel free to leave your own favorite children's books about grief in the comment section below. This is a favorite book at the Kansas City Hospice House. I don't remember if you ever saw it while you were here. I know Lee (our chaplain has recommended this book to me). I like this book very much but looking at my 4 year olds (nearly 5) I would doubt they would read this book, although they would be able to comprehend most of the themes. I am privileged to have a copy signed by the authors and illustrator--I met Taylor Bills through his uncle who is a friend of mine. I know that Lee read this book over several sessions of IDT meeting at Hospice House--there were a few staff members with tears welling up in their eyes, so I don't think the book's utility is limited just to kids. I think it works best for families to read the book together, making explicit correlations with the child's own loss ("Grandy had a great loss, like we did when Grandma/our pet/your friend died"). For younger children (especially nonreaders), family members can read the book multiple times to the children. The children can then "read" the book themselves between by telling themselves the story based upon the pictures as they recall it. It can serve as a conversation starter with older children as well if the family discusses the concepts as they read it a few pages at a time (breaking the book into serial reading such as Lee did for the IDT meetings). Grandy's dog is my favorite--he's on every page so that the children can search for him. This book is loved by every "stoic" or "macho" person I have given it to. It has passed from NYC firefighter to NYC EMS. Amazing opener! Thanks for sharing Marty. Your writings have been very helpful to those working with grief.